Liver damage can happen in a number of different ways, diseases such as Hepatitis C, Liver Cancer, Cirrhosis, NAFLD non-alcoholic fatty liver disease, fatty liver can all cause liver damage. In a lot of cases liver damage happens when liver is neglected whilst being continuously overworked and overloaded. This mistreatment of the liver is most commonly done by drinking too much alcohol, eating unhealthy processed foods and other vices such as smoke and or drugs. This type of neglect can cause minor liver damage to start with and then transform and evolve over time into something much more serious such as Cirrhosis or Liver Cancer. Some symptoms to watch out for when it comes to liver damage are; changes in the color of your urine to a dark brownish or dark orange colour. Also watch out for the whites in your eyes turning a more yellowish colour. If you begin to notice these things book an appointment and get it checked out with your GP. If you do happen to notice these things you can start to help your liver by going organic and staying away from processed foods, did you know that even pasta is a processed food? 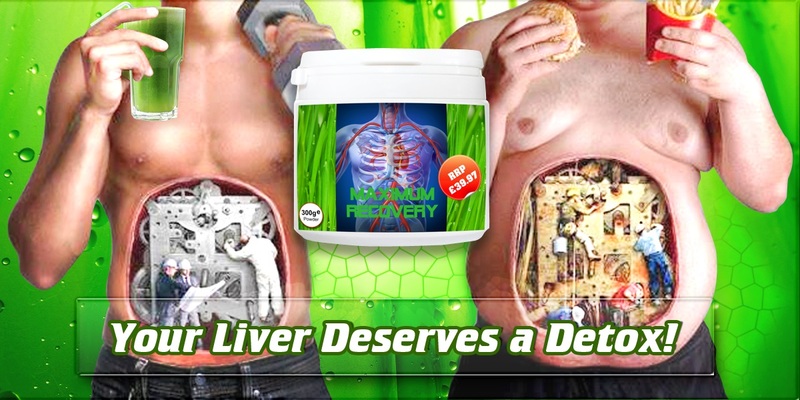 Your liver loves water and craves it in order to stay hydrated, therefore when water is mixed with 35 liver cleansing super-foods.... it becomes a no brainier that Maximum Recovery is one of the best treats you can give your liver... No mess, no fuss and no hassle.Click here to checkout Maximum Recovery.